For over thirty-five years, Concord Academy Summer Camp has been providing such experiences for children in the greater Boston area. A summer camp experience should be fun-filled and exciting. But the right program for your child can become much more: an opportunity to explore, grow, develop new skills, and form lasting friendships in a safe and nurturing environment. Concord Academy Summer Camp is fortunate to have access to all of CA’s first class facilities, providing campers with an extensive array of activities, rain or shine. The campus abuts the Sudbury River, where campers learn to canoe and kayak. There are full-sized sports fields as well as the campus quad, Chapel lawn, and six tennis courts for all sorts of games and sports. Indoors there are two gymnasiums, a wrestling room, and four squash courts, meaning the action does not stop when it rains or is too hot to be outside. A 2,500-square-foot dance studio and a 400-seat theatre are used for dance, drama, music, and all camp events. The camp also has use of three visual arts studios, a full ceramics studio, computer labs, classrooms, a woodshop, and conference rooms for group activities. All campers also eat hot lunch everyday in a spacious, air-conditioned dining hall. Concord Academy Summer Camp is located in historic downtown Concord, Massachusetts, on the campus of Concord Academy, an independent college preparatory school for grades 9 through 12. Chartered in 1922, the school enrolls approximately 365 boarding and day students from more than ten countries and twenty-three states. 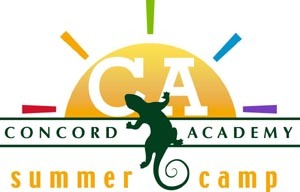 The Concord Academy Summer Camp is an accredited member of the American Camp Association (ACA).